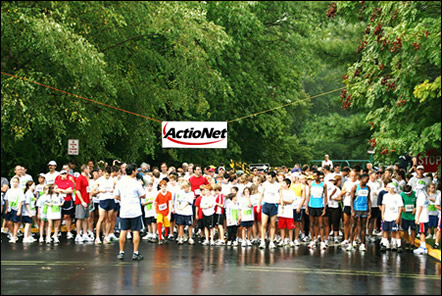 ActioNet is a proud sponsor of this year’s St. Luke School 2nd Annual Wildcat 5K and Family Fun Run, which will be held on September 26, 2009. The 5K course is a shady and scenic pathway going through gently rolling hills in McLean, Virginia. Starting and ending at Saint Luke School, the 5K route will traverse the adjacent neighborhoods and streets. The route involves pavement and sidewalk paths, with a mix of moderate hills and flat terrain. The half-mile Family Fun Run takes runners around Saint Luke Church and Saint Luke School and then across the finish line, where children are awarded with commemorative finisher medals. The race’s start and finish equipment and services are professionally provided by the Amazing Race Timing company. Fundraising is necessary to keep Saint Luke School current and competitive. One of the main focuses of the Saint Luke School Parent-Teacher Organization (PTO) is raising money to benefit the school’s students and teachers. The PTO raises money to fund school-wide social events, cultural arts programs, facility improvements, educational enrichment materials, and teacher gifts. The public is invited to participate in the race. Registration information and race details are available at http://www.wildcat5k.org/. The race will begin promptly at 8:30 a.m. The fee for the 5K run is $25 per person. The fee for the Half-Mile Family Fun Run ages 5 & up is $12 and under 5 participants are free. Come join us for a day-long event of health, fitness, and fun for the entire family!